Todd Peck picked up the 5th last-place finish of his NASCAR Camping World Truck Series career in Friday’s PPG 400 at the Texas Motor Speedway when his #50 Image Tech Chevrolet fell out with electrical issues after 1 of 167 laps. The finish, which came in Peck’s 32nd series start, was his second of the year and first since Dover, three rounds ago. It ends a streak of two consecutive lasts by Mike Mittler’s MB Motorsports. In the Truck Series last-place rankings, it’s the 10th for the #50, the 33rd by reason of electrical issues, and the 351st for Chevrolet. Across NASCAR’s top three series, it’s the 49th for the #50, the 115th by reason of electrical issues, and the 1,601st for Chevrolet. As of this writing, Peck and Scott Stenzel are tied for the lead in the LASTCAR Truck Series Championship. If the championship ended today, Stenzel would take the title by a single bottom-twenty finish, thanks to him running one more race than Peck. 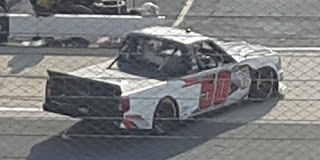 Peck’s return to Beaver Motorsports’ #50 team came after the team’s back-to-back 28th-place runs, first with Jamie Mosley at Kansas, then with Timmy Hill at Charlotte. It would be Peck’s third Truck Series start at the Texas oval, following a 28th for his family’s team in 2015, then a 24th last year for D.J. Copp. Peck was one of the 33 drivers entered to attempt Friday’s 32-truck field. He was also one of the seven drivers who didn’t run the weekend’s only practice session on Thursday. This ultimately meant Peck would not turn a lap until the race itself. The second practice was washed-out by rain, and the #50 was the only truck to not turn a lap in qualifying. He still made the field on Owner Points, securing the 32nd starting spot. Missing the race was Mike Harmon, who committed to the Truck Series race in Texas while B.J. McLeod drove his Chevrolet in the XFINITY race in Michigan. Harmon turned a lap of 163.349mph (33.058 seconds), which placed him ahead of not only Peck, but also Norm Benning’s 162.656mph (33.199 seconds) and Jennifer Jo Cobb’s 162.352mph (33.261 seconds). Like Peck, both Benning and Cobb managed to make the race on Owner Points. Benning and Cobb qualified for all eight races in 2018, Peck’s #50 only missed Atlanta, but Harmon’s #74 failed to qualify four times, which proved decisive. On Friday night, Peck incurred a redundant tail-end penalty for unapproved adjustments. The same penalty went to Dalton Sargeant, who surrendered the 28th starting spot in GMS Racing’s #25 Performance Plus Motor Oil Chevrolet. Just seconds into the seven-lap green-flag run, Peck pulled behind the wall, followed three circuits later by Cobb’s second truck, the #0 Driven2Honor.org Chevrolet, driven by Camden Murphy. Finishing 30th on Friday was Justin Fontaine, who drew the first yellow when his #45 ProMatic Automation / Superior Essex Chevrolet, running 23rd, pounded the outside wall in Turn 4. The 29th spot went to the victim of the next yellow, Bayley Currey, whose #83 Fr8Auctions.com Chevrolet snapped loose in the high lane off Turn 4 and hit the outside wall with the right-rear. The tail end of the field barely missed Currey’s truck as he fought for control on the apron, the rear decklid flapping from its tether. Rounding out the Bottom Five was Kyle Donahue, back at the track for the first time since driving the #83 at Kansas. This time around, he drove MB Motorsports’ #63 Chevrolet, once again with backing from First Responder Racing. Donahue turned 13 laps before overheating issues during the Currey caution. *This marked the first Truck Series last-place finish for the #50 at Texas. *Chevrolet, which swept the final six positions in Friday’s race, has now finished last in 31 consecutive Truck Series races.